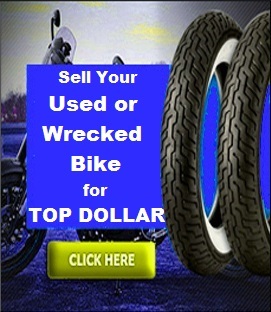 Submit the form above or Call 1-800-428-7821 for immediate access to our salvage yard network and thousands of Yamaha Used Motorcycle Parts. 73 yamaha tx650 Any parts - need key for ignition/gas cap. Code 2624 Also misc. parts for fenders, shocks, seat. 97 yzf600r Transmission, fierings (all), ignition assy. Id like to price a motor as well. 09 XT250Y L/H scoop (tank cover) and front headlight cover. 81 yamaha exciter sr 185 : cdi box. 03 yamaha v star silverado 1100 : Used trike kit or side car. 05 midnight star silverado 1700 Looking for a passing lamp retaining ring. Mine broke at the retaining tab at the bottom and flew off the bike at 70 mph. Never found the ring. 06 r6 Frame needed 4 a crashed yamaha r6 I have some savable parts 2 rebuild another. 01 custom v star 650 LOOKING FOR VALVE COVERS FOR MY BIKE. 01 yamaha custom v star 650 Engine vavle covers,chrome or plastic..
02 v star custom 650 double seat,with back rest if possible and rear foot pegs if at all possible. 06 yamaha yzfr1 Looking for a complete set of passenger foot pegs (arm, foot peg, bolts). 81 yamaha xj650 I need a complete running motor. 06 vstar classic 1100 after market exaust cobra,vance&hines ect. 81 yamaha xv920 set of aftermarket staggered exhaust pipes made by either Mac or Jardine. 81 yamaha xt250 cap for air cleaner box. Part No 3Y1-14412-00-00. 82 xj maxim 750 ajustable backrest made by KG. 02 r 1 1000 altenator cover, front turn signals, left mirror, shift lever linkage and foot peg assembly. rear sub frame tail section and rear body paneling brake light assembly. guts of tail section. 09 rhiano 2 rear aluminum ome wheels 12"x7.5"
77 dt 250 I am looking for a seat, l/h side cover and an ignition switch. 05 silverado 1100 i am looking for some cheap aftermarket slip on pipes loud ones. 01 yamaha vstar 1100 classic an aftermarket non keyed gas cap. I also need a horn and the chrome snap fit engine covers that go on the top of the engine. 2000 yamaha yz 250 Need an engine. Lost the engine out of the back of my truck. MY son is really upset with me. 92 fzr1000 : just an older bike, rusty inside gas tank, never wrecked but fell over in garage. 78 sr 500 Seat and cowl, engine, helmet lock. 99 royal star 1300 antenna bracket(radio not CB), metal pivot section & screw also black spacer. 84 yamaha xt 250 valve assembly for the secondary carburator. Mine has a torn rubber boot. 99 yzf r1 headlight assembly, front cowling, front fender. bike is blue and white. 05 yamaha virago 250 Handle bars and front left & right turn signal and rear fender in black. 06 yamaha ttr 230 Has been wrecked but still very drivable. 73 yamaha ltmx 100cc This bike has everything in it, and everything is working and fixed. Except it is missing the exhaust pipe. New crankcase gasket, new screws on gear shift mechanism, new break cable, basically fixed and ready. Everything is there except the exhaust. 85 virago 700 good bike my sale price is 1200.00 it has never been wrecked.it has 33765on it.no major problems it really runs good. 04 yamaha fz1 Headlight Assembly-No broken tabs or rash.,Shifter.,Left side Frame Cover-Silver, bolts onto the frame right behind the engine, no rash. 97 yamaha virago 750 speedometer,speedometer cable,passenger seat backrest.